A new place to play at Levy Playground. 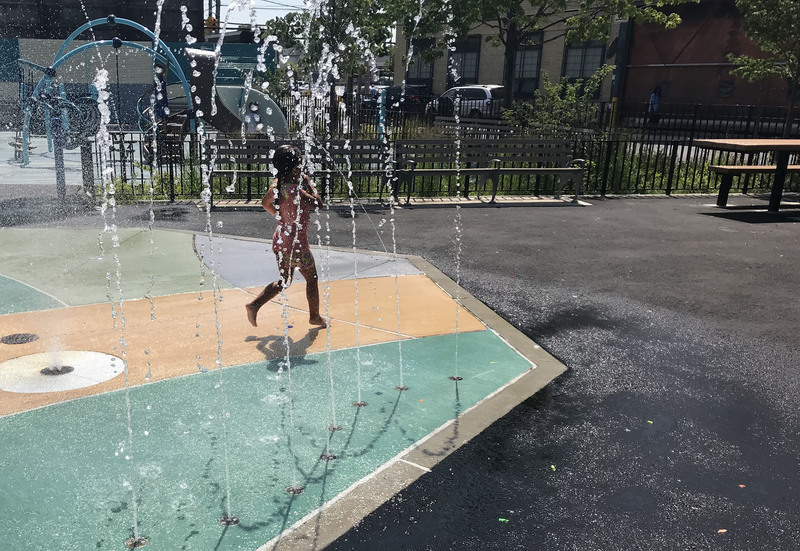 “It was well worth the wait,” says Staten Island resident Bianca Raso as her young daughter runs through the spray showers at newly reopened Levy Playground on a scorching hot summer day. 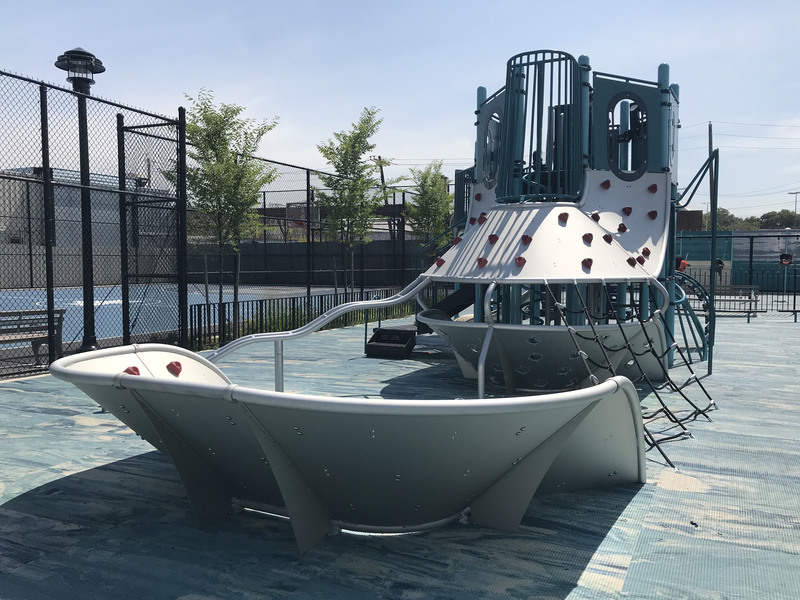 The Levy Playground in Staten Island and two others nearby have reopened after a much needed transformation, complete with “green” upgrades. The New York City Department of Parks & Recreation renovated three parks along the borough’s North Shore to improve flood resilience and to provide green spaces that improve quality of life for the surrounding communities. These park re-openings are part of a series of recent renovations funded by the City’s Community Parks Initiative. The Community Parks Initiative is New York City’s program to address equity by looking at “parks that haven’t seen investment in well over 20 years in specific locations that are experiencing high growth, density and have poverty,” explained NYC Parks Commissioner Mitchell J. Silver, FAICP. Lifelong Staten Island resident Tanya Johnson says renovations at Levy Playground and other parks in the area were “long overdue.” With $318 million dollars in funds from Mayor Bill de Blasio, the Community Parks Initiative is targeting 67 parks throughout the city. 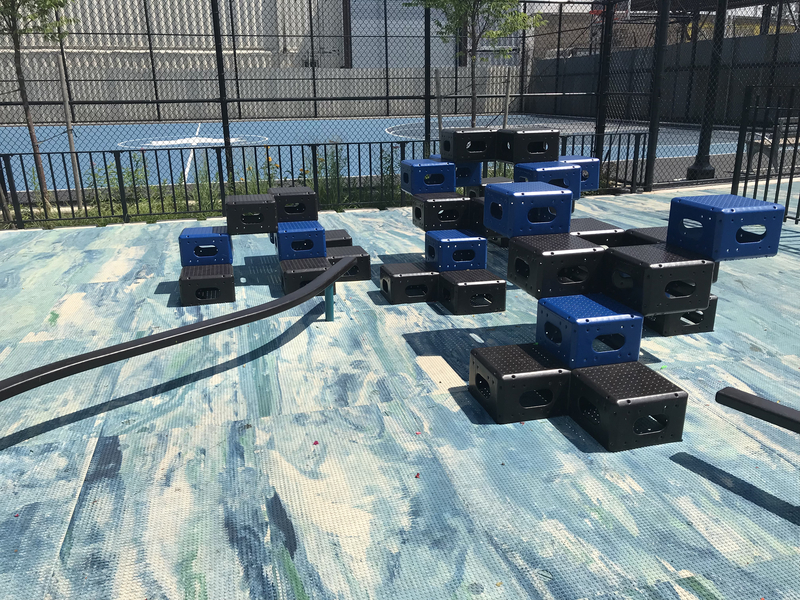 An additional $50 million dollars from the NYC Department of Environmental Protection is helping to install green infrastructure in these parks, taking advantage of an opportunity to rebuild better and greener. 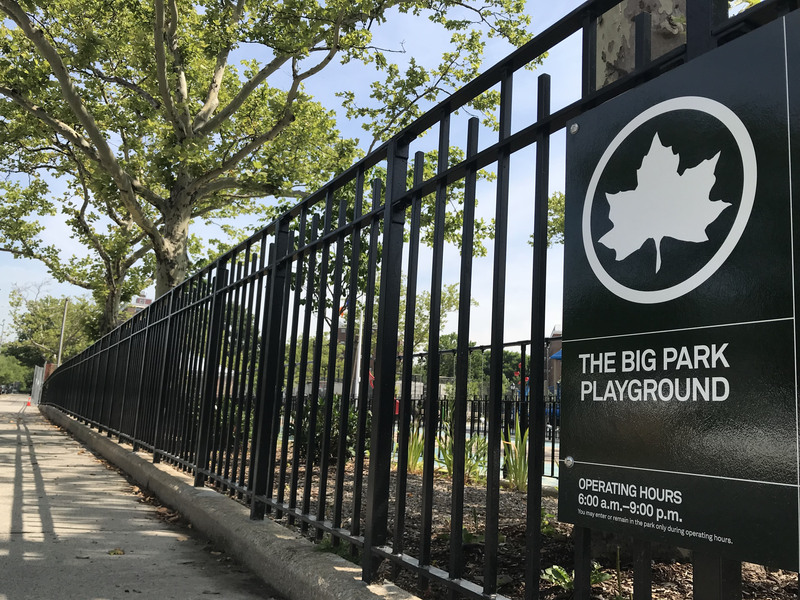 In Staten Island, NYC Parks estimates that the newly-in-place green infrastructure will capture yearly totals of 560,000 gallons at Levy Playground, 1.2 million gallons at Arthur J. McDonald Playground, and 1.5 million gallons at The Big Park. This will reduce the impact of flooding due to runoff, or water that stays above the ground because of impermeable surfaces like concrete. 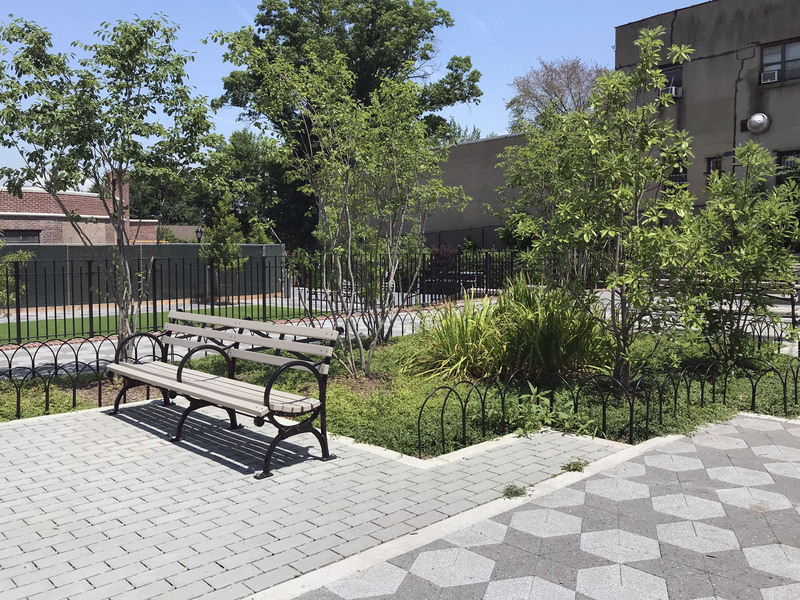 Cooler pavement, like the permeable pavers seen here at Levy Playground, can make a park a more enjoyable place to relax on a hot, sunny summer day. All three parks also feature rain gardens, another type of green infrastructure, with plants and specially engineered soils that absorb water and infiltrate it into the ground. Rain gardens, placed in low points in the park, collect runoff that would otherwise flood the street or storm drains and absorb, evaporate, or infiltrate this excess water. As water is filtered through, plants in rain gardens can also reduce pollution by filtering out pollutants before they reach groundwater or other bodies of water, as these pollutants otherwise would in runoff. New trees have been added throughout these three Staten Island parks, and others preserved. Trees can reduce temperatures of surrounding areas by as much as 10 degrees, providing relief to summertime visitors especially during heatwaves– and reduce the impact of the “heat island effect.” The heat island effect, according to the New York State Department of Environmental Conservation, is a direct consequence of an abundance of heat-absorbing materials in urban spaces, with few trees. In vulnerable neighborhoods, this effect contributes to increased temperatures and pollution levels, and higher rates of associated health problems. Commissioner Silver, who is an award-winning urban planner, noted the ability of trees to reduce the heat island effect and improve air and water quality, in addition to adding beauty. By providing shade and cooling the air, trees can cool their surroundings during a heat wave–which are predicted to become more frequent and severe due to climate change. Parents seem happy about the new sustainable features and “kid-friendly and parent-friendly” designs in these parks. “We’d like to see more like it incorporated into all parks,” said Tanya Johnson as she pushed her children on the swings. “Especially in Staten Island, cause that’s where I live,” she laughed. Spray showers let keep kids cool in the summer heat. The showers turn off automatically after a few minutes so they won’t stay on, wasting water. Next Post What Are Art And Hip Hop Saying about Climate Change in Staten Island?